Between October and November of 2019 the 14th version of the Media Arts Biennial will be held, celebrating 26 years of existence. It has covered, in its 13 previous editions, through historical reviews, theoretical reflections and aesthetic practices mainly the relationship between art and science. In this coming 14th edition, named THE LOGIC OF VERTIGO, a collective uncertainty and instability (fundamental characteristics of the creative process in art) will be provoked and reflected. Our capacity for discernment, affected by the overstimulation of images and sounds, finds our perception completely saturated. It is perception the great victim of all problems in our civilization, addicted to social networks and collectives hallucinations, has turned our minds into an area of invisible sacrifice. The conversation will be based on: The indiscriminate cognitive extractivisms that turn our thoughts and actions into a inharmonic saturated network. The educational system based on the repetition and memorization of formulas and the constant bombing of our nervous system by ideological, economic and political marketing strategies. ENRIQUE RIVERA: is an independent curator and researcher. Studied Audio Visual Art at the Film School of Chile, and the University of Chile followed by Art Direction at Universidad Mayor. He has conducted a series of research and installations based on the use of electric energy and intangible means as a representation strategy, a field of practice that has expanded towards his curatorial research. He founded and directed the Persona Gallery in Santiago de Chile(2003) and was part of the creation of the video art archive of the Documentation Center of La Moneda Cultural Center. At the ZKM in Karlsruhe, Germany, he researched and developed the exhibition Multionode Metagame, related to the www.cybersyn.cl project. Currently is the director of the Bienal de Artes Mediales de Chile (www.bvam.cl) and president of the Chilean Video and Electronic Arts Corporation, from where he is preparing the curatorial framework for the 14th Media Arts Biennial, themed around the relationship between humans and data as a new force of nature. 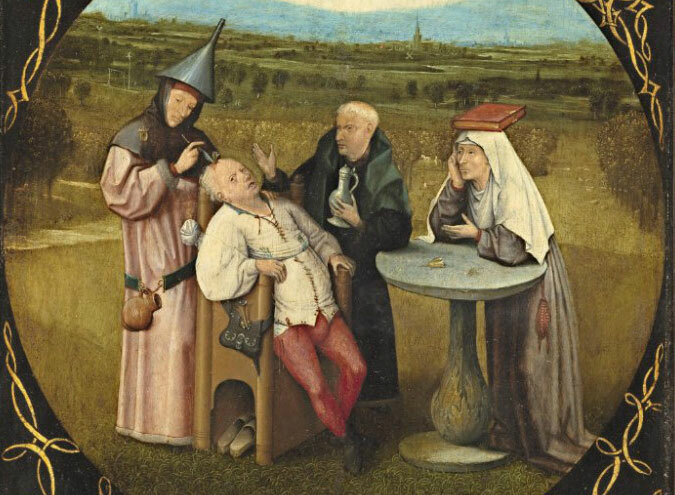 Image: “Master, take away this stone soon, my name is Lubbert Das,” wrote Hieronimus Bosch in his painting “Extraction of the Stone of Madness” (1505). Bosch makes an ironic and direct criticism of pre neurological medical procedures manipulated by religion. Which would be the works recognized that represent the criticism of the 21st century?